Whilst the weather for the last week and the Bank Holiday Weekend has been less than seasonal, there has still been a lot of activity around the launch point and a lot of flying going on. Don't miss out on the opportunities to fly during the rest of the soaring season - the forecast for the rest of the week is looking good! Other successes come by way of Booker pilots competing in the Open Class and 15Metre Class Nationals and the Gransden Lodge Regionals. Richard Crockett was flying his Nimbus 2 in the Open Class Nationals at Lasham and came in 26h overall. Shack Roberts was flying his Ventus in the 15Mtr Class at Hus Bos and came in 16th. William Parker competed in the Gransden Lodge Regionals in his Discus and finished 3rd overall. Highlight of the week for William was his day win on Saturday. Hopefully he will 'tell us how he did it' at some point as none of us were there to hear his report at the briefing the following day. Of particular interest is how William started the season with some specific goals, one of which was to win a day in a Regionals competition - it goes to prove the worth of having goals and objectives at the start of each season and not losing sight of them at whatever level your flying. It doesn't matter whether your goal is to be World Champion in 2 seasons time or going solo before the end of the season, they are all valid goals and achievable if you put the time and effort in. Another interesting and fulfilling week at Booker. The Task Week didn't provide the most promising of weather, however the most was made of it and some great flying was undertaken on Monday and Friday. Monday produced high cloudbases and strong thermals with several pilots doing the task 300k of Chievely, Towster, Cambridge, Mursley and home and others achieving personal bests. Friday was forecast to be another good day but the conditions proved quite tricky after all the rain the day before and took a while to get going. 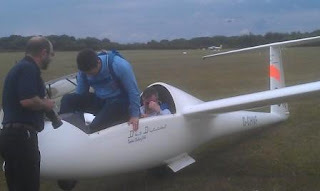 The sky around Booker was full of gliders all trying to stay airborne under a cloudbase that refused to go above 2,500' for a long time before some intrepid soles set off on the task of 219k (Burbage, Basingstoke, Faringdon, Booker). Judging by the comments from pilots afterwards, it was as difficult as it looked and most pilots regretfully abandoned the task (except for Tim Scott in his new ASW29) and opted for other tasks. Friday did produce a first solo with Ali Elliott in CFA. Ali only started in June on an Basic course and clearly liked it enough to top with extra flying to go solo. Her comment after her solo was that she intends to carry on doing more flying and cannot wait for the chance to experience cross country flying. Other achievements during the week include Rob Turner completing his first 100k (that he's ever claimed), Simon Vardigan flying the K18 for the first time, James Cooling (one of our regular tuggies) becoming a power flying instructor and Will Hilton being checked out as a new tuggy. Congratulations to them and apologies to any one who has achieved something new and different this week who has been missed out. Steve Baker, MP for Wycombe paid us a visit on Friday. Steve, a keen free fall parachutist, sailor and motorcyclist is not your average MP. He was keen to get a deeper understanding of what we do at the Club. So we consigned him to the front seat of the Duo for a flight with Jim White. Steve was very helpful to our Olympic airspace team and asked a question in the house about our Club and subsequently arranged an appointment with the Minister, Theresa Villiers. The Booker team consisted of Denis Campbell, Alan Green and Emily Todd. Their good work has resulted in the reduction of restrictions from two months to one month. The Club was visited last Monday by the government team responsible for for setting up and managing the Olympic airspace, to discuss how we will operate during that period. 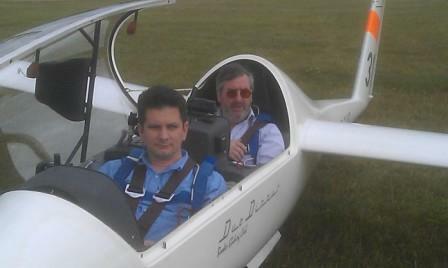 Jim was very complimentary about Steve Baker’s potential as a glider pilot! Thanks for the visit Steve and for listening to us so well. In a similar vein to Booker's Easter Egg Cup, Lasham run an aerobatics competition for a group of their pilots who meet each week on a Sunday to train. Care of Graham Saw an invitation was received from Lasham to take part and 3 pilots were ordered to compete (having been given 24 hours notice!) to ensure Booker's reputation was upheld. The format of the competition followed the BAeA schedule for Beginners and Sports level sequences with all manoeuvres being flown in K21's. The standard of flying at both levels was extremely high and competition was fierce. When the final results were in, Booker Cadets Guy Trees and Will Hilton were placed First in Beginners and Second Place in Sports respectively. David Humphries made up the remainder of the team and also flew a creditable sequence at Sport level. Lasham members made us very welcome and ran a well organised competition, our thanks go to Charles Baker who organised the event. Also over the weekend Will Ellis continued his winning streak by winning the Interservices Regionals (Open Class) flying a Duo Discus. As well as the pressure of competition flying, Will also had to contend with taking some of the senior Directors from his employer along on some of the flights. On top of all this, there was the immensely successful BBQ in the Blister hangar to celebrate the decision not to build a stadium on WAP. This was attended by over 150 guests from GASP and BGC. A huge amount of effort went into organising this and thanks to all who helped to make it such an enjoyable evening. 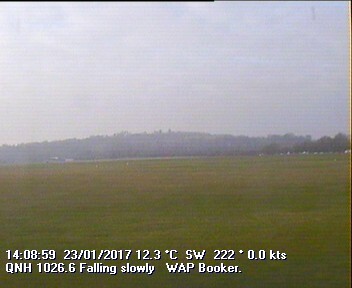 Booker Gliding Club is truly a great place with a fabulous future made possible with all the skills and talent around allied with the enthusiasm shown by all. "Gentlemen, you are the best of the best"
A wave flight... of sorts! I missed the lift on Tuesday evening (damn work getting in the way again), but I didn't miss the fantastic views near sunset. And this evening didn't look that promising, but I had my first wave flight! Okay - the wave was tiny, both in strength and area, but it was fascinating flying in and around the small, long, misty clouds perpendicular to the wind at 1800ft. Despite an overcast start at Booker the day just got better. The sky looked great in East Anglia, but it was tricky finding the strong climbs, although there were some very good lines of energy. There was quite an impressive cloud behind CFA this evening! Summer has arrived at last. Yesterday was the most fun I have had all year. Short task but fantastic conditions. Started probably an hour too late not expecting much on BOB BUL BUC BO1 BOO 208k. By 1420 the sea air was blown on a moderate SE'ly beyond OVE cutting off my approach to BUL (see left). After a bit of dithering I took a climb at KGS to cloudbase, now 5000ft, and glid at best LD in and out of BUL back to NES over the top of the slice in still, gently advecting air. It was like being in weak wave. Never done that before, great! At NEW the sky went ballistic again with 6000ft bases and 7kt climbs. A climb to 5000ft S of BUC gave me an easy 63k final glide home into a 12kt S'ly. Looking N from BUC it was just the same as far as the eye could see and I heard on the radio two guys having a great time around Wittering. By the time I left the field at 1730 the sea air had come all the way up the plain as far as DID, don't recall seeing that before either. Congratulations to Will Ellis on winning the sports class at the Bicester Regionals with 5032 points after 7 days competition, 350 points ahead of the next placed pilot. Pretty good in glider that doesn't climb! It was a bit of wait for scoring yesterday as they landed most of the field out again, including Watty. Having led the field all week a little whoopsy on the last day let Owain and Derren through to win the Open class.